The latest national profile on Gov. Susana Martinez is in The Washington Examiner, a right-leaning publication. The article by reporter Rebecca Berg is pretty glowing and there's not much that New Mexicans haven't seen before about the gov. She's a "popular governor, with approval ratings in the mid-60s, and she is a Hispanic and a woman, two demographics that have so far eluded Republicans on the national level." and "She’s maintained a tough-but-compassionate persona through her career ..."
The story also gives examples of how Martinez has differed with prevailing GOP positions on some issues. Martinez, whose husband is in law enforcement, supports a national gun registry to prevent sales to people with proven histories of mental illness. And she approved an expansion of Medicaid in New Mexico that was an option under President Obama's signature health care law, a step some conservative Republicans have likened to embracing the law in its entirety. 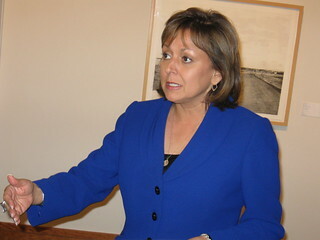 Despite the headline -- "Is New Mexico Gov. Susana Martinez a Republican VP candidate?" -- the piece includes what might be Martinez's most recent denial that she would accept a spot on the national ticket. First she talked about why she declined to be considered for Mitt Romney's running mate last year. Were her state record subjected to further scrutiny, New Mexico Democrats say, it would not hold up. “Anyone considering her as a running mate should be aware, she will be the Sarah Palin of New Mexico,” said New Mexico Democratic Party Chairman Sam [Bregman]. Martinez’s predecessor, former Democratic Gov. Bill Richardson, declined an interview because he has “a very negative opinion of Martinez,” a spokesperson said. I have the feeling we haven't seen the last of such articles.